For the three weeks after the Chaska Tri in July I continued on my frenzied training schedule of 6 workouts a week over 5 days. I was assuming I’d be doing another tri in just over a month. Then my parents came into town for a week and I only trained 1 day. Then the next week we got a puppy and I didn’t train at all. Long story short… I scrapped the second tri for the year and have been only running, biking and weight training only once or twice a week since. I haven’t swam once in the month of September and that’s really where I need the help. I guess I need the event to motivate me to train. That being said… I’m looking into some runs to do this fall (5ks or 10ks) to keep me working out more consistantly. I really do get a lot of satisfaction out of working out and being in shape. I guess I also like to just be able to say I work out and stay in shape too. I’ll post more on my run training and suspect I’ll continue to bike and swim some as well. My First Triathlon is in 2 Days! Wow! This is coming up quickly. I’m just hoping the weather holds. Yesterday it was saying 40% chance of thunder storms for Saturday and now it’s showing 30%. It would really stink if there was a thunder storm and the tri got cancelled. Man… that would be a let down after all the training and preparation. Last night I broke down and bought a tri shirt. I wasn’t going to, but changed my mind last minute. I was back at Start Line last night, where I bought my shoes, to pick up a pair of Yankz laces for my shoes and found a deal on a Sugoi Fuel Tri Shirt in Cobalt, so I bought it. For those of you who don’t know, a tri shirt is made to be worn for all three events. This one is basically a tank made of spandex (and other fancy space age materials). In comparison to a cycling jersey… it’s tighter, the material is thinner, the zipper goes about 3/4 of the way to your wast on the front of the shirt and the pockets are smaller, tighter and on each side of the back, instead of all the way across. I actually tried it on, which is very unlike me. It’s a good thing I did, as all the fitment guides online seem to put me in a Medium. I put on the medium and it was so tight you could see my chest hair through the shirt. I didn’t come up with that one… it was actually the sales woman’s comment. It was so tight that when I tried to take it off I had to pull it down over my shoulders and step out of it, instead of pulling it over my head. So large it was. Now I’ll look like a pro and, hopefully, not perform like a rookie. The Yankz lacing system is basically elastic laces that you put in your shoes and adjust to fit. Then you just pull your shoes on and you don’t have to tie them. It’s supposed to speed up your transition time. Today I’ll be purchasing the rest of the materials to make the Team Triple H Flag for our transition area. Then tonight I’ll do my swim, lube up the bike (she’s all degreased already) and put the flag together. An interesting idea was brought up today via email by my teammates. We really haven’t talked too much about any of us beating one another in the race. Sometimes Michael and I mention that Ben will whoop both of us in the swim, but no one has mentioned who might actually have the best time. Now there’s been a wager placed. The loser must buy a round. It’s getting interesting. The Chaska River City Days Triathlon is this week! I’m amped. I’m not all that nervous, just excited for the event. The nerves really only come from the having never done all this before – picking up the race packet, getting onsite at 6:00 in the morning, setting up transition area, coordinating Team Triple H’s families… But I’m ready for the swimming, biking and running. I did a decent swim yesterday and ran about 1.5 miles at a brisk pace afterwards. It was the first time I’d swam in the tri shorts. What a difference in drag. You get a lot more out of your strokes. I’ve set a swim goal for myself of under 20 minutes and I’m feeling like that is certainly an attainable time. Maybe it’s not aggressive enough, as I’ve been able to do that pretty easily in training. I’m just accounting for last minute nerves, open water and the mass start. Training overall is going to lighten up this week. I’m going to squeeze another 2 swims in, but my run and bike will be less demanding. Durations will be pretty much the same, but intensity will go down. I’m saving up for the big day. I got some new rubber for the bike this weekend at REI. I also got new tire levers, 3 tubes, some cheapo Chilis sunglasses and a couple of new water bottles. Today I ran some errands to get a new Helmet (the old one is way too old to be effective – besides having a cracked core), some new goggles, a number belt and 1 pack of Clif Shot Gel to try. The helmet is a Specialized Chamonix from Erik’s Bike Shop. I’m on a budget, otherwise I’m sure I would have been tempted by one of the other more pricey models with more color choices. While there I also picked up a pair of Tyr brand goggles – nothing fancy, just more adjustable than the speedos I currently have. Then I ran over to The Running Room and bought a number belt and the energy gel. Erik’s didn’t have the non-caffenated versions of Clif gels, so I got a Razz flavored one and The Running Room. If it’s decent tasting, doesn’t give me gut rot and actually seems to work, I’ll buy a few for the race. Tonight I’m going to see if I can’t find me a Tri shirt locally for cheap. Sounds like Gear West Bike and Tri may have some for a reasonable price. I may be in trouble for the expenditures when I get home. If the tri goes well and I decided to do more (which I think I’ve already decided), my tri expenditures will probably continue to be a problem. I’m going to have to find another source of income to support it. I’ve already got a nasty motorcycle accessory addiction, which I’ve been neglecting because of the tri training. We’re (Team Triple H) already talking about the post-race festivities. Sounds like it should be a good time. Ben and Michael seem ready to go and now Michael is talking like he may want to do a tri next year as well. Today we headed out to the desert. First we went to the Ahava factory. Ahava is really high end skin care products made from the minerals and mud from the Dead Sea. I’m pretty sure that was for the ladies of the group. After that we went to Mesada, which is where a Jewish sect of about 900 called the Zealots holed up against the Roman army for 3 years (year 70 AD). The settlement/palace was built on the top of a mountain by Herod as an escape from the Romans (which he never even visited) and only accessible by a crazy climb or cable car. Because it was so remote, the ruins are fairly well intact. 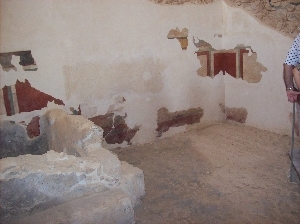 The photo is of the remains of the ritual bath area. On the way out, Gabe and I spotted another mullet. 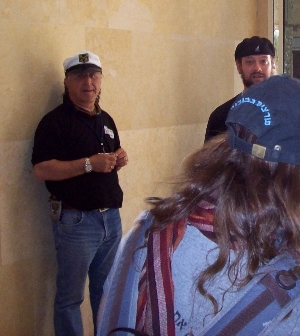 We could take hundreds of mullet shots every day, but this one was funny because he was wearing a sailing hat. By the time the Romans were almost able to enter the city, the entire population (aside from 3 women who hid in a water cistern) were dead. The men had taken care of the women and children and then killed each other. One of the remaining women killed the last man. This is where we get the term “zealot” – from this Jewish sect. 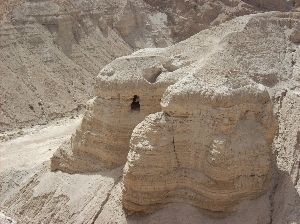 We then went and saw where the area the dead sea scrolls were found – Qumran. It was found in a cave (pictured) by two Bedouin (sp?) shepherd boys by accident. They had lost their sheep and were throwing stones into the mouth of a cave to kill time and heard one stone crash into a jar, so they went to investigate and found the scrolls. Next we went to the Dead Sea for a dip. Of our group of 16, only 5 of us went in. Because I went in, I didn’t get in pics. My dad did and I’ll try and get those up before I get back. The experience was awesome. You float with zero effort and in as little water as 16 inches. As I mentioned in the entry about Ahava, the mud and minerals are used for skin care. The water feels slippery or oily. The mud is ultra-fine and you are supposed to smear it on your skin with positive effects. It definitely exfoliates and your supposed to feel the effects for a few days after your swim. We then went to Jericho, which is a Palestinian area. It was interesting because it’s not a very popular place for tourist. We saw a famous 2000 year old sycamore from the story or Jesus and Zacheus. Finally, on the way home, our bus just about died. The air conditioner crapped out, the bus sputtered to a stop and black water started pouring out of vents in the ceiling. Eventually it got up and running and we limped back to the hotel.